A friend recently shared this New York Times article about a Red-tailed Hawk spending time outside the White House. Attracting spectators, it perches above the East Wing windows and hunts gray squirrels. The article includes a quote from Theodore Roosevelt, former president and “birding citizen-scientist-in-chief,” who listed 93 species he spotted around Washington and on the White House Grounds. Roosevelt notes at the end of his list, “Doubtless this list is incomplete; I have seen others that I have forgotten.” Roosevelt’s sentiment reassures me about my list, for it too is “doubtlessly incomplete.” It also solidifies my changed opinion about listing in general and using tracking sites, like eBird. Originally, I was skeptical of bird-sighting apps (*shakes old lady fist at newfangled technology*). I thought it would draw attention to sensitive species locations and cause greater disturbance due to enhanced visitor traffic. But now I realize it’s especially important for people to know where birds are. And subsequently, when they go missing. Roosevelt’s list from 1908 paints a picture of the White House grounds with more forest birds sighted than today. The suspect cause of the missing species is habitat loss and knowing this sort of census data may ultimately help scientists help birds. I’d say that the pros certainly outweighs any cons. 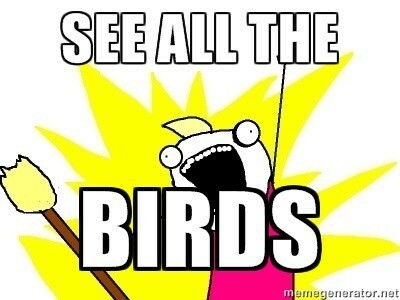 So, let’s go see -and list- all the birds! This entry was posted in Fun Bird Facts, Why Bird by audge29. Bookmark the permalink.